#New Release!!!! 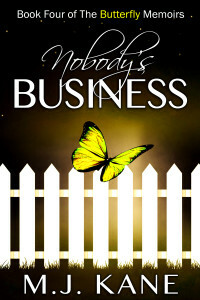 NOBODY’S BUSINESS (Book 4 of the Butterfly Memoirs) and Contest!!! I am excited to announce the release of the next novel in The Butterfly Memoirs series! This story is nothing like the previous novels. There are new characters, and a new set of stories. If you’re new to the series, take a moment to get to know the characters by following this link. Already caught up? Then grab your copy today and dig in for another exciting read! Don’t forget to share the news by entering the Rafflecopter contest below for your chance to win a gift basket filled with AUTOGRAPHED COPIES of all four novels and butterfly swag! The month long contest will give you plenty of chances to enter and you can enter as many times as you want. Follow this blog tour schedule to learn more about MJ, her characters, and the story. Not only will this blog tour be held online, there will be chances to meet MJ in person, as well as tune in to radio interviews and chat! M.J. Kane stumbled into writing. An avid reader, this once stay at home mom never lost the overactive imagination of an only child. As an adult she made up stories, though never shared them, to keep herself entertained. 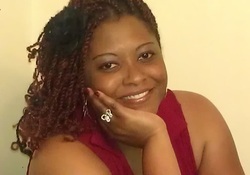 It wasn’t until surviving a traumatic medical incident in 2006 that she found a reason to let the characters inhabiting her imagination free. Upon the suggestion of her husband, she commandeered his laptop and allowed the characters to take life. It was that or look over her shoulder for men caring a purple strait jacket. And the rest, as they say, is history.